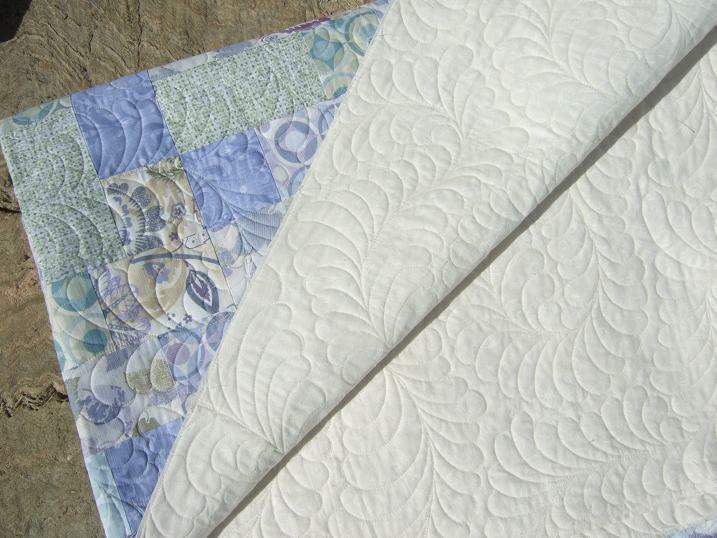 So here it is, my first attempt at meandering feathers on a real quilt. I have done this once before on a solid coloured fleece throw that I posted a tutorial on and loved how it looked but I was worried that when I try it on a pieced quilt I would have trouble seeing were I was going. 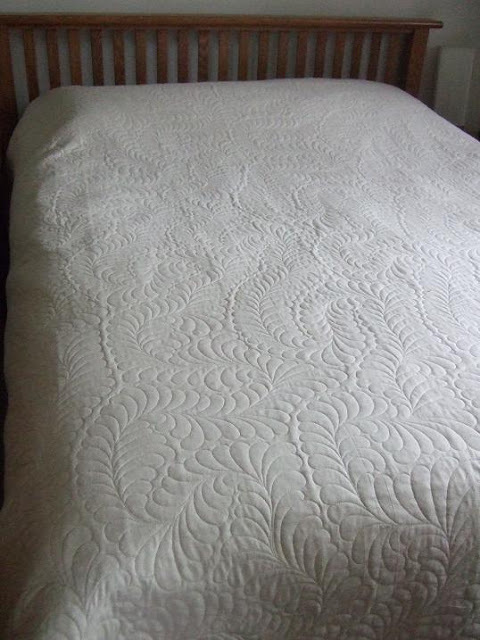 It went much nicer than I anticipated and I now have the confidence to quilt this one someone's quilt if asked. This is my Hopscotch quilt and I have no idea what I'm going to do with it, I just liked the fabrics and thought it would be a good practice quilt to try something new. I love how it looks on the back! I still have to bind it but couldn't wait that long to post pictures. I am going to use the purple fabric in the tiny border for the binding. It has a great wholecloth feel when you look at the back. Gorgeous!! Can't do those feathers...they are beautiful! 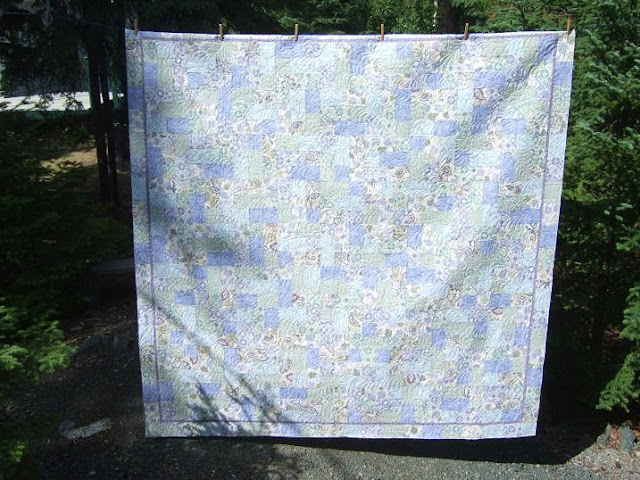 It's beautiful Kathy....I have some 120" lovely soft cotton...one day I will do something similar...one day! Kathy you've done marvelous! Also very pretty wall decoration to inspire you in your quilting shack :) Pretty, pretty and great job! Thank you for sharing!! the feathers are gorgeous-front and back! Beautiful feathers. 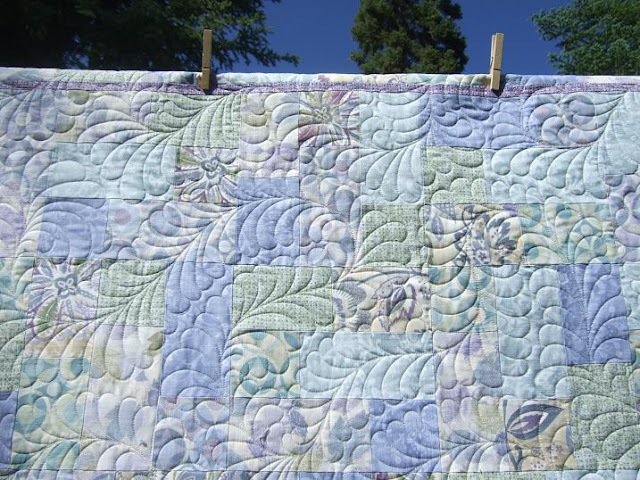 I like how they are giving the quilt texture in the photo of the quilt hanging on the line - they show up really well on the front, and then look like a wholecloth on the back. Very nice! I need to learn to do feathers. Looks absolutely gorgeous!! I love all the texture on the back too!! Such beautiful quilting - the feathers look fabulous! Beautiful feathers! They look wonderful. I'm making this for my mom for Christmas! I'll use some dress fabrics I have. Such a great idea!